Our inspiration was Baby Aaden's Safari Nursery Bedding. We didn't want it to be too literal so we used the color palette from the bedding to create all of the various design elements. Dessert Table: The Dessert Table backdrop foundation was a 40x60 foamcore board found in most crafts or office supply stores. We used a scoring board to craft multiple sizes of the medallions in various colors and hotglued them overlapping and layering each one for the desired look. Chocolate covered cookies with safari animal art details and brownies were the stars of the Dessert Table. We crafted treat bags for animal crackers for another non-literal Safari element. TIP: Don't affix the medallions to the board until you have crafted all of them and done a layout on the foamcore. You can then make adjustments as needed. Welcome Table: We handcrafted the guestbook out of scrapbook paper- the log pens were found at www.whitewitchwares.com Corsages: Used a tutorial from www.jonesdesignco.com The corsages were affixed to hand-tied branches for guests to pick up as they arrived. Centerpieces/Other Decor: Organic Manzanita Branches www.bloomsandbranches.com were used for the centerpieces adorned with moss covered balls and butterflies to complete the look. 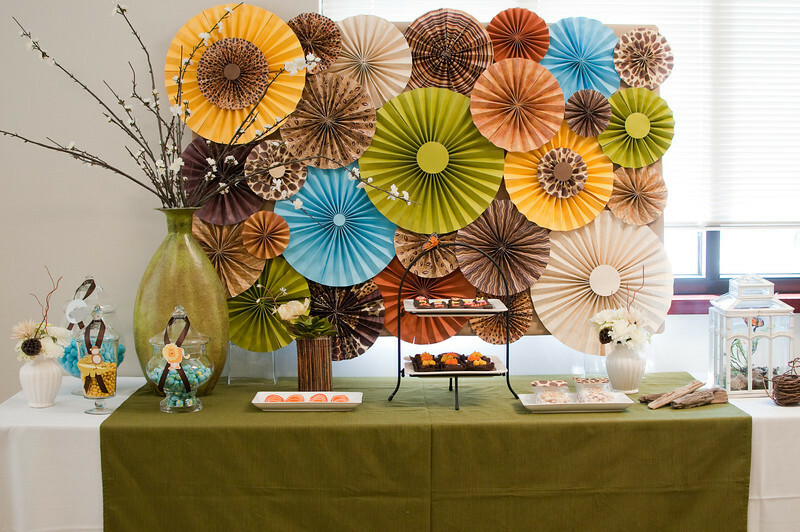 Colorful paper lanterns www.lunabazaar.com warm up the room and mimic the circular patterns of the backdrop medallions. Layout everything as you go......stage all items so that you make edits along the way. Ooooh! Very nice! Love the theme and the attention to detail. wow, love the backdrop for dessert table and paper roses, so creative! thanks Dawn! appreciate that…..we love all things unique!! I absolutely love everything that’s handmade here. The paper medallions look really pretty and the centerpieces are just beautiful. The handmade guestbook is cute, too. I say you did a really neat job! love love love! That backdrop is amazing, great job, 5 stars definitely! what was the size of those paper lantern?